No recipe from me. I spent the day in rental cars, buses, trains, planes and automobiles. There is nothing happening in my kitchen tonight! What budget recipes do you have to share this week?!?! Thanks for hosting this linky! I can’t wait to check out all of the recipes! Thanks for the carnival…and safe travels. 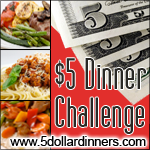 Love this site, I’ve gotten so many meal ideas from you! Thanks for hosting this, can’t wait to find some new recipes! I’m glad you got home safe! Thank you for hosting! i just posted a sloppy joe recipes that has a lot of veggies in it that is inexpensive and convenient to make. It makes 2 batches plus there are leftovers for lunch. Thanks! I’ve shared one of most popular recipes this week – Almond Flour Pancakes! They are yummy with a big pat of butter and some quality Grade B maple syrup! Thanks for hosting these recipe exchanges! Hope everyone enjoys a frozen treat thrown in here with my Hot Chocolate Popsicles…… the best part is (besides being delicious, of course) they only cost around $0.75 to make 10 of them. Woohoo! I just have to say that my Ice Cream Cake is not necessarily a “healthy” recipe (with the Oreos for a crust) but…..I love making my own hot fudge sauce, because I know it has “real” ingredients….personally, I usually don’t eat the crust, but just stick to the ice cream and hot fudge! LOL!